It’s been difficult not to hear about B.A.P, considering their debut rocked the K-pop scene with their serious lyrics and all-blonde hair. While the hair changed for their newest mini-album, the serious themes didn’t. And right at the forefront of all of that, taking part in writing lyrics for B.A.P, is none other than their leader, Bang Yong-guk. Yong-guk had already impressed with his feature in Secret‘s Song Ji-eun‘s solo venture, “Are You Crazy,” and his own song featuring B2ST‘s Yang Yo-seob, “I Remember.” So it really comes as no surprise to hear that he was involved with the underground hip-hop crew, Soul Connection. Yong-guk first began meeting with other members of Soul Connection when he was in his second year of middle school after posting his rap lyrics on an online forum and being recognized for his skill. Through meeting with seniors that were actually active in the music industry, watching them compose and produce, and learning from them, he was able to refine his own techniques and become better at making his style of music. While performing with Soul Connection, he took on the name Jepp Blackman to give a strong impression. It’s speculated, and unconfirmed, that part of this name came from his love for African-American soul music as Yong-guk has once said: “If I can be born again, I’d like to be born as an African-American and do music.” Yong-guk eventually left the crew, but he still did music by himself underground. He wanted find his own music, the type that was truly him. In 2010, Yong-guk was contacted by TS Entertainment to be part of a hip-hop idol group after the duo Untouchable recommended him. Though he was worried that the type of music he could make would be limited, TS Entertainment assured him of being able to live out his dreams. Thus, he joined. I want to start with this song because Yong-guk has a greater role in this one as opposed to songs sung with more members of Soul Connection, such as in one of their albums, RapsodY, a 2009 Soul Connection compilation album. Blackout was also present in Maslo’s album, Young MAStory, which was released in 2008. But this single is the first one released separately as just Blackout. The song was released in 2010 and has a smooth vibe to it. It’s a relaxed song with a simple, but very rhythmic background track. 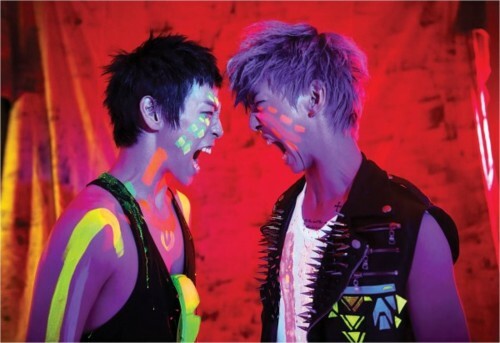 Maslo and Yong-guk have very distinct styles of rapping and singing, with Maslo’s voice being thinner and more high-pitched and Yong-guk’s being thicker, raspier, and considerably more low-pitched. They make for good contrast in the song. The laid-back flow also fits the lyrics, which speak simply of love. Yong-guk’s rap here is softer than what he’s done with B.A.P (even in “Secret Love” and “It’s All Lies”), and it’s interesting to see the changes or progression he’s had. And Maslo just plays it right all the time. I’m not quite sure how else to say it. It’s clear why Maslo has released three albums of his own and featured in numerous songs. Many will say that Maslo sounds like G-Dragon, and they both did debut in the same year: 2006. But Maslo did a lot of work pre-debut, as far back as 2002, some of which was finally released in Young MAStory. This song, “I’m Ballin’,” made it onto RapsodY. As someone from the U.S., this song really reminded me of some of the cleaner American rap songs I’ve heard. It’s another song about attraction to a girl, but that is to expected from the younger age. With songs like this, and all songs that have some form of rap, I feel that it’s unfortunate that I don’t personally know Korean because of the great care that goes into choosing the best words that have the desired meaning and the order for the greatest impact and sound, especially for raps. Aside from that I chose this song because it’s primarily Yong-guk’s work lyrics-wise and through the rapping. Also, in comparison to his work in B.A.P, the rapping is more loose and raspy while it’s now a more focused sound. Just take a look at the beginnings of “Warrior” or “Power.” Though this could also be a result of the difference in style of these songs. B.A.P’s current music has more of a rock feel imbued in them that makes the background track louder and have more impact. Yong-guk’s work with Soul Connection has simpler background tracks because it’s more about the lyrics and the raps. This is the last song I’m going to share here. Also on RapsodY, this song has Csp, Still PM, Maslo, Jepp Blackman, and KUAN. This song was actually performed on Mnet’s Prestar1 Show in April of 2009. It’s the title song of the album and actually has a music video. The track has four other artists other than Jepp Blackman, and it’s a good example of how these different styles of rap and hip-hop were able to meld together to make a cohesive and mellow-sounding song. The song is pretty evenly distributed amongst all the artists, which in K-pop groups is rarely seen. I particularly like how the background music barely changes throughout the whole song, yet each part has its own flavor due to the artist currently performing. They all rap with distinct styles, so you can easily tell when each person’s part begins and ends. It’s impressive that Yong-guk was skilled enough to be included among these other artists that were all older than him and mostly had more experience with creating the style of hip-hop they all preferred. This is just a small sampling of the work that Yong-guk did pre-debut with Soul Connection. It’s also possible to find tracks of his work with Untouchable, a current label-mate, and Crucial Star, who was under Soul Company until its dissolution in 2011, among others. Honestly, it’s nice to see someone in a K-pop group that has this kind of experience and desire to make his own music. I hope that this track of creating music with strong messages and beautiful language continues with B.A.P, with Bang Yong-guk at the helm. If any of this music interested you, I hope you look into Soul Connection and other underground hip-hop artists. Their style is really something to be appreciated. The Mnet link at the end of this article can lead you to the track list for RapsodY and even small previews for songs approved for those under 19. Most songs can be found on YouTube if you search well for the artists. So, what do you think about this different side of Bang Yong-guk? And about this type of music, especially in comparison to most K-pop?